The charity uses 360-images on Facebook to show what's often really going on behind the lens. Social media (particularly Facebook) has a reputation for making a person’s life seem more lavish than it really is. But, remember, not everything that glitters is gold. That’s the problem with photos on social media these days: one does not always see what really goes on behind the lens. 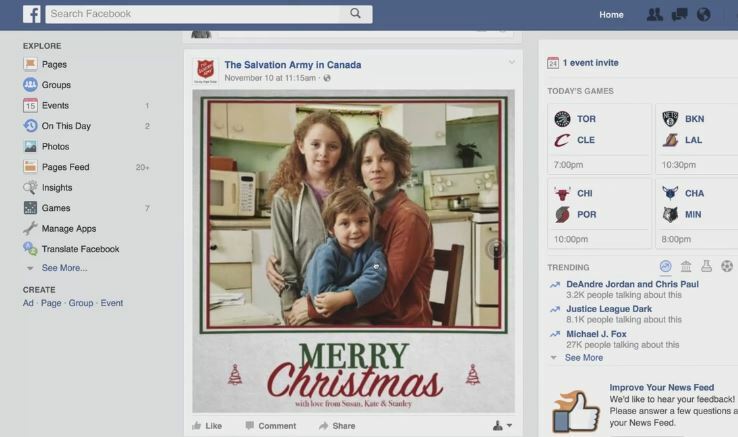 And that’s the point the Salvation Army and agency Grey are trying to make in this series of Facebook 360-images that attempt to bring awareness to the issue of “hidden poverty” by showing the rooms in which happy family holiday photos are taken. Viewers can explore the room by toggling and dragging the images, which contain the line “Poverty Isn’t Always Easy to See. Especially During the Holidays” on the walls of each home, further cementing the idea that poverty doesn’t just exist on the streets. Ever since Facebook launched its 360-image feature, we’ve been waiting to see how brands would use the immersive technology and what trends would come out of it. This isn’t the first time a cause brand has used the “behind closed doors” tactic, revealing what’s really going on behind and around the camera lens. Just last week, Kids Help Phone and J. Walter Thompson used a 360 image to demonstrate the behind-the-scenes bullying that occurs in schools, which has already garnered 2,700 likes and nearly 1,000 shares.